No onion rings. They gave me fries instead. I was crushed. Crestfallen. Livid. Incensed. My mom called around that time and the first thing I did was lament my plight, walking her through the ordering process, emphasizing how very clearly I spoke the words “onion” and “rings.” My babysitter got multiple re-enactments of the saga, the Sonic employees becoming increasingly sinister with each retelling. After sulking around the kitchen and frowning at the zillions of free, nutritious things we had to eat in the house, I finally managed to move on, working in one final “But I WANTED onion rings” jab as I munched on leftover meatloaf. Later that afternoon I was squeezing in a little prayer while the kids rested, and the thought popped into mind: Why didn’t I turn to God in that situation? It’s especially odd because I always turn to God when big issues arise. When I’ve faced potentially life-changing problems like financial difficulties and health scares and surprise pregnancies I’ve turned to God, frequently praying about his will for the situation, remembering always that he can bring good out of any situation, clinging to my faith even when it seems like God is silent. Why on earth, I wondered, would I turn to God during big life crises but not in fast food mix-ups? Why is it second nature to cling to him during times of great trouble but not in the little annoyances of daily life? I’ve been pondering that a lot over the past few days, and I think it comes down to this sad truth: I don’t turn to God in the little things because I don’t have to. In the case of the missing onion rings, the pain wasn’t bad enough to force me to turn to God. I had other options. I could find some measure of relief through things like gossip, detraction and self pity, sinful actions that that made me feel better in this insignificant situation but that wouldn’t work to sooth me with a bigger problem. Also, I simply had other options to improve the situation without God’s help. My problems here were within my control — if I’d cared enough I could have gone back to Sonic and I’m sure they would have happily given me the onion rings. I didn’t need God to fix it because I had this one covered myself. I’ve known for a long time that one of the things that distinguishes truly saintly people from the rest of us is that they turn to God with even the smallest daily matters, that they don’t compartmentalize life into “times to turn to God” and “times not to turn to God.” And now I see why. It comes not only from a deeper understanding of the truth that God is with us at every moment, but from a deeper faith and love. The shift that takes place when you begin to turn to God and prayerfully trust that he will bring good out of paper cuts and stubbed toes and lost onion rings is the shift of beginning to turn to God not just because you have to, but because you want to. Thanks for this light-hearted reminder to turn to God in everything because without him we can do nothing~not even fast food cravings! Might the Lord, who smiles at your "Saint Diet," have deliberately sabotaged your onion ring order to get you back on track? I wouldn't put it past him. So true all that you have mentioned. But something else struck me as I was readinig and munching on something I "deserved." Maybe I don't turn to God in little things like food because I know what he will say? For me, pretty sure that's it. If you're anything like me, another reason for not turning to God in this type of situation is that you're ashamed: It's your fault you succumbed to the temptation to order onion rings in the first place, so how dare you ask God's help in coping with the bad feelings you so deserve? While I don't think *God* sees it that way, in the moment I often do. If I had been in that situation (and I'm often in such, indulging in something I had previously given up), I feel slightly guilty about the indulging, so it feels wrong to ask God for help in this thing I feel shouldn't be doing anyway. Of course, such behavior breeds larger sins like gossip and anger and impatience. It isn't that I don't trust Him with it, but that I feel His honest help would further frustrate my efforts, instead! Oh, sweetie, God did fix it. He knew you didn't really need those onion rings! 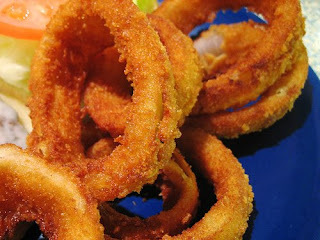 Great post…but now I want some onion rings! Hi Jen, I think you're getting hit hard by the carb things because you're tired. Your body needs energy and it's seeing the only option as food-sleep more if possible. I know about this b/c it happened to me after my third baby. Others have already said the thing I picked up on halfway through your post – God was there with you the whole way through. He answered a prayer you made a long time ago about sticking to your Saint's Diet. He kept out the onion rings. When I feel I don't turn to God often enough I try to remember that my whole heart has turned to God in love and trust, and that's one big prayer all the time. I totally, absolutely, completely agree with you about how we (I) separate events in our lives into "God things" and "what we (I) can handle myself, thankyouverymuch." How we need to turn to God not just because we HAVE to but because we WANT to. But I sympathize with you on the loss of the onion rings. They are one of my most favorite treats EVER. Susanne, munching sanctimoniously on baby carrots as I type…. God fixed me up with a fast food mix up the other day…they gave us the wrong burger, so they made the new one and gave me the "wrong" one for free…I was just going to have some fries…I guess Baby in utero need more, so God fixed it up for me! You are just so insightful…the Holy Spirit definitely speaks to me through you. I am so thankful I was led to your blog. 1) I understand completely about the onion rings. Those things are magnificent. In fact, they reduced me to tears on more than one occasion during my first pregnancy. So, rant on. 2) This post reminded me of one of the funniest encounters that I've had with the realization that God is at hand ALL THE TIME, not just during the big ones. I was late for a class in college… because I was looking for fruit snacks. And I couldn't find them. Finally, I gave up, but on my way to class, I asked God if He could do anything about this situation… although if I am being honest, I wasn't expecting anything. Wouldn't you know- there was a presentation in class that day on mythical heroes, and their prop? Superman fruitsnacks. They passed them out to the entire class. And, as I was leaving, the professor said that she didn't want all of the extra ones, so she asked me if I did. I walked out of that classroom with 3 boxes of fruitsnacks. He is there. And He really does have the most wonderful sense of humor. "a spectacular backward three-point-turn swan dive off the wagon" – so funny! I love onion rings too. Brilliant insights. And, oh, how I needed to hear that little kick to my bum to get me moving closer to God. Thanks for the encouragement, even if it does hurt like getting fries instead of onion rings [smile]. "…not just because you have to, but because you want to." That is profound. It's the story of a mature believer, really. God isn't our just our Lord. He's our confidante, our hiding place, our shelter and intimacy. It all comes down to motivation. Why are we doing the things we are doing? Because we have to, to be a "good" Christian? Or because we want to? I'm not sure there's anything wrong with a little ranting about a food order gone wrong. A little complaining – justified in your case! – doesn't strike me as particularly sinful – when is blowing off steam a bad thing? After all, you didn't yell at the Sonic employee, you didn't inconvenience anyone by turning the car around and heading back to correct the order, you didn't do anything but feel and voice some annoyance at an annoying situation. You realize you -will- have to go back and get some of those Onion Rings. At Sonic at least, they are vastly superior to the fries. As for talking to God about all those little things, Jen, if you have not read the book, Practicing the Presence of God (Brother Lawrence), you might find it helpful. It is short and insightful. Don't you see that this was actually a good thing? Didn't get the onion rings. Didn't eat the onion rings. Didn't get the guilt of eating the onion rings. Unless of course you ate the fries. You didn't eat the fries. Did you eat the fries? In an angry carbfest? And then were mad because they didn't taste anything like onion rings? I'm personally still on the fence about the whole prayer thing (whether it "does" anything), but of course, I would think God's time isn't like our time, so you can still turn to God about it even though the moment has passed. If you didn't eat the fries, you could turn to God in thanksgiving for the quirk that saved you from eating the dreaded carbs. If you did eat the fries, you could turn to God, admit your frustration over your recent spate of food weakness, and ask for a strengthening of your will. Can't hurt. FYI, Sonic dips their onion rings in vanilla ice cream batter. I worked at Sonic during High School and College. That's why they are so sweet and addictive. 1. The onion rings in the pic made me soooooo hungry! !